A vouchercodes.co.uk survey (February 2017) put the UK national average weekly restaurant spend at £44 with 18-29 age bracket happy to spend £88. The reasons given for this spend commitment sound incredulous using my Gen-X mentality. 44% do not have “enough food at home”; 38% “do not want to have any washing up”; 20% “never learned how to cook”; 14% want to “keep the house tidy”! Still that is the survey evidence. When asked to compare their dining habits in the 1980’s, many responders said eating out back then, “eating out” was done primarily on special occasions. Whilst demand factors are strong, so is cover supply. A good eating out concept quickly mushrooms. The king of the “Fast-Casual” market, “Nando’s” grew from 1 branch in Johannesburg in 1987 to 1,094 globally with 339 (31%) in the UK after opening 2 branches in 1992. This heavy UK exposure reflects the relative attractions of the UK eating out/ takeaway market. Short-term headwinds exist. Higher payrolls, workplace pensions, higher input costs and a squeeze on disposable income. This explains the sector’s move recently. Domino’s flagged slower UK trading (c.4% pizza delivery) a function of the cooling of the very high 14% growth rate observed over 2014-2016. Base rate increases/ higher inflation are likely to temper growth going forward to low/mid single digits. The weak consumer response to “Winter Survival Deal” suggests Domino’s high pricing is impacting demand. The board responded with “Walk in Wins” and “BoGoF” which obtained a better response. This is encouraging as pricing had become problematic for the customer base in some areas. A major benefit of Domino’s franchisee model is its ability to obtain upfront payments from new franchisees, i.e. third party funding of Domino’s growth. Store expansion (950 +9.3% in 2016) and (990 + 4.2% H1 2017) has been rapid. Domino’s recent acquisition of 75% of its largest London franchisee for £24m is more opportunistic / higher risk expansion. 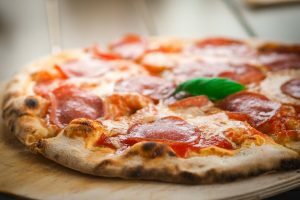 Domino’s expansion abroad is mid stage (revenues £23.8m 4.35% / 8.2% of store footprint is located in Switzerland, Lichtenstein, Luxembourg, Norway, Iceland and Sweden) with recent investment increasing stakes in operating subsidiaries (£21m was spent taking the majority interests in Norway and Sweden to 71% and the Icelandic business to 51%). The consensus forecasts suggest 16% revenue growth over 2017-2018 with EPS growth accelerating in FY18 after a tough FY17. Clear evidence of improved trading in some of the overseas territories would be positive for Domino’s. The business now encompasses a number of disparate overseas territories moving at different speeds. UK saturation is a concern, at Domino’s. Recent moves to bolster shareholder returns i) £15m share buyback (1.05% share capital) ii) 15.6% dividend increase suggests a board keeping focused on returns. Restaurant Group is a UK diner with a number of brands, Frankie & Benny (F&B), Chiquitos, Garfunkels, Coast to Coast, Joe’s Kitchen alongside its pubs and concessions business. Typically these are in high footfall areas, such as UK airports and shopping centres. New CEO Andy McCue, former CEO of Paddy Power arrived to turn around Restaurant Group after a tough 2016. During FY2016, Restaurant Group closed down 37 underperforming restaurants incurring total exceptional charges of £116.7m related to early lease termination and impairment charges. McCue stuck to the new opening plan, opening 24 new restaurants. Key to profit improvement is the recovery of the largest brand, F&B (258 sites) where customers had reacted badly to price hikes. McCue cut prices at F&B introducing a 2 course £9.95 meal offering. The turnaround plan includes 7% average price cuts at both F&B and Chiquitos. The business is broadening Chiquitos (79 units) appeal to include Tex-Mex/ Californian cuisine and a competitive menu. McCue has also reduced central roles/ overheads by £10m via streamlining roles/ supplier rationalization. Restaurants Group’s revenue growth is derived primarily from new openings (16-20 new units are planned for 2017) costing £16m-£20m. It remains in a transitional period in 2017 as it absorbs purchasing cost increases, higher payroll and rates bills. The valuation is depressed given the uncertain timetable to volume growth and the resumption of price growth. Whilst a recovery in profits to their levels in 2015 is still a way off, the consensus forecasts envisage an EPS rebound in FY18. Recent interims showed operations were stable with decent cash generation and £16.3m reduction in Restaurant’s bank debt to £19.3m. This is partly attributable to a better response to the new menu. The board needs to show volume/ pricing growth in the key brands alongside delivery of the £10m savings plan (c. 20% of operating profit). M&A activity is prevalent, and RTN is vulnerable to a takeover approach. Food ordering website Just Eat typically charges each takeaway a joining fee and a cut of every order (c. 12%) with supplementary charges to appear higher up in the online list. Just Eat also encourages its listed businesses to offer discounts on online orders during quiet periods. The board also point to significant marketing savings for restauranteurs using the Just Eat website. Prior to Just Eat, a takeaway would have the evening trade, the retail client, phone orders and online orders assuming they had installed their own website ordering. Just Eat’s access to 27,000 restaurants enables very quick consumer choice and delivery albeit at prices that may represent a premium to the shop price. The benefit for many takeaways is the ability to lift prices, under the guise of the improved IT/ deliverability. Partner growth (no of Just Eat website listed restaurants jumped to 75.4k + 9.2k at H1 2017. Just Eat interim revenues (£276m+44%) and pre-tax profit (£49.5m +46%) represent a split of 57% UK / 43% international locations. Just Eat has a market leading position in Canada and Denmark. Just Eat is expanding into Spain, Italy and Mexico where the online ordering concept is under developed. Strong revenues have yet to translate into shareholder dividends as Just Eat prefers to chase market share in undeveloped markets, it agreed to invest £100m into technology, marketing and the acquisition of “SkiptheDishes”. Just Eat is expected to grow EPS in 2018 by 38.5% hence the premium rating – the board is not expected to introduce a dividend over 2018. New CEO Peter Plumb joined on 18th September and should confirm 2017 revenue guidance of £500m-£515m with underlying EBITDA of £157-£163m. Competitive pressures appear to be building which could involve partner migration at some point. Just Eat might respond with more M&A activity, it has only tentatively completed acquisitions to date. Significant earnings growth at Just Eat is priced in hence any earnings disappointment would be taken badly. If you are interested in buying any of the above shares then it’s very easy to open an account. Whether it’s an advisory account you are after or an execution only account simply register your interest here and a member of the CSS team will be in touch.